Setting up Email Notifications on your web forms is as easy as 1-2-3. You'll be able to get emails whenever you receive a response from your web forms including checking them out from almost anywhere. IMPORTANT NOTICE: If you're trying to test the email alerts using the TEST EMAIL button, please note that this will always send the email to the email address that is registered with your JotForm account. Instead, you must make an actual submission on your live form to test the newly added recipient email address. Please refer to this guide for more information: How to Properly Add Change and Test a New Email Recipient Address. 1. Click SETTINGS at the top of the Form Builder. 2. Next, click EMAILS on the left nav. 3. Click the PLUS + icon. 4. Then, select NOTIFICATION EMAIL. (Left) EMAIL tab: This is where you can make changes the email template and subject header. (Middle) RECIPIENTS tab: Here you can define the recipient email address(es) for where you want to receive an emailed notification about a new submission from your form. You can also set the Sender Name and Reply-To Email. (Right) ADVANCED tab: In the advanced tab you can change here the Sender Email Address and other email settings. In some instances, you may also choose to implement your own custom email as the Sender E-mail Address. If that's the case, you can refer to this guide on How to Add a Custom Sender Address to an Email Alert. Additionally, if you're having issues with your emails not being received, we recommend you check out this guide on How to Prevent Email Bouncing Related Issues. NOTE: If you're looking for a way to setup a text only email, this is not possible anymore. The new wizard will allow you to only change the HTML email, text only emails are actually no longer used as mobile devices are becoming more common and all can open HTML-based emails without issues. Why this my account is not valid? I see in the recipient's email here you can add multiple emails. I need this option so I can prove later on that the client who is filling out the form has also received the email. Unfortunately, under the Recipient Email field on my forms, I can chose only one email, there is no option for multiple emails to be added. What can I do to have multiple emails? I need the same email to go to a few recipients, so any recipient can see that the other recipients have received the email. NEMOHU SE PŘIHLÁSIT ! Žádala jsem o nové heslo a nepřišlo. Mou email.adresu poznal. I want the email notification to go to Juli when they choose her and to me when they choose Karyn on the top of my form. Can you please call me. very useful. thank you for all the information. I build my websites for my work and everything in connection with it. 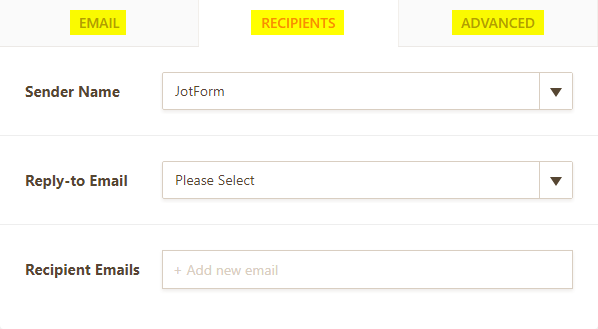 I have only used Jotform as a contact and registration form and am very satisfied with it my modest ratios are enough for the free version of Jotform. software UX and UI is great .it’s very simple and easy to use, So any can easily handle it without undergo any special training . thanks for product. It is not updating the email address.. see below. Call us asap! I signed up for the ad for $450 to advertise the iphone X on you car and I sent the application in that I had to fill out will I receive a confirmation on the job? Please unsubscribe me. I subscribed because I was answering another ad. I seen ur ad at the bottom of the registration form. So please unsubscribe me. Thank u it would be much appreciated. When you receive an email is it like the google form where you have to click into a spreadsheet to view the senders name, email, message ... ? I am wanting a more standard contact form and email. I want to view the senders email address and message within the email I receive. This way I can reply directly to the email without clicking and coping things from a spreadsheet. Thank you! image slider is loading images very slowly. Can I insert my pdf form into the jotform system? And by using the data the public has inserted via jotform system to fill in the pdf ? After that they can get the pdf application form with their personal information via email notification? please let me know the way via sending email to my email account. 1 – Click on windows key + i to open setting panel. 2 – Now, in the left menu, click on Notification & Actions. Now, in the right space, just make sure that show app notification option is turned on, if it is not turned ON, then turn it on as shown in pic below. 3 – Now, click on start key and click on mail app. 4 – Now, once the mail app opens, Click on the setting Icon as shown below and then click on Options from the menu which opens up. 5 – Now, scroll down and find where it is written Notifications, just turn on the option saying Show in action centre. Now, check the option saying show a notification banner . You can also check the option saying Play a sound , but if you do not want to get annoyed by sound alert of new mails, then you can leave this field unchecked. Is it possible to set up conditional email notifications such that a field only displays in the form when it has been filled? Is it possible to put a background photo in email sent after submission? and put the name and surename on the photo? Is it possible to set conditional email notifications? For example, if Field A=Yes, send to recipient X. If Field A=No, send to recipient Y. Looking for help. I've deleted the entire notification showing me the information from the person completing the form. Is there a way to add back in the template? Or do I have to recreate it manually? Is it possible to insert the description of a particular field? For example a student registers for a course number and in the description we put the date and time of the course. I would like to incorporate that into their e-mail confirmation but i am not finding how I can do that . As far as I can tell, I've set up the email notifications section properly but whether I do a test or a live submission, neither my own address nor the second notification address are getting e-mails. Can anyone point me toward what I should be checking to fix this? Is this to notify me when somebody fills out my website form or is this to send the person who fills out the form a copy of their submission??? tried it several times. Did not work. Very frustrated. I've already followed all the directions in the setting up email guide. I've published the form on a Yola site, also following directions. Each time I test it I fill out the form completely and hit 'submit'. I've checked my junk folder. I even tried setting it up with another email, in case the problem was with my own email. Nothing works. I don't receive any email notifications. thank u for send the mail. How can I receive text subsciption in my email box? The ability customize email notifications is great. I have been using the source code form text areas in my form to add a look and feel to my notifications. I even use the form builder interface to prepare the email look and feel then copy the source code into the email notification - fantastic. Hi - I am still presented with the old style email/notification window. is there a way to force the new style to be used instead? Also - edits that i make in the email table are not saved when i click on the Finish button. Is this a known issue / Is there a way to fix? How to strip headers in address field and move each information to a new line in email notifier?